I generally promote Bards In The Woods Sunday afternoon events in public access woodlands of Ireland from National Tree Week in March until end of October. Between end of October and early March its the native tree planting season. For this winter I suggest that tree planting focuses on trees for food. Hazels are easy, they take well and grow well but the native tree that has almost vanished from our woodlands are wild apple trees, crab apples some of us say. I propose that we aim to plant many more wild apple trees this winter. Here's a way this can be done. - Cut up a favourite apple and remove the seeds. 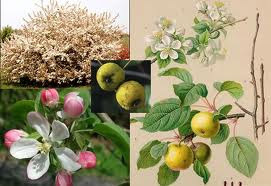 Most apple species are from grafting onto wild apple root stock. Wrap the seeds in wax paper, greaseproof paper, and store for 4 weeks in a cool dark place, garden shed maybe. - Get some zipper Ziploc bags or even the small Ziploc food containers and half fill with potting compost, and place a seed in each bag or container. Moisten, then keep in a refrigerator, bags take up less room of course, and leave for 3 months, maybe December, January, February. Better still is November, December, January. - Prepare planting posts, a bit of compost on the bottom, empty bag or container with seed, and then top the pot with more compost and moisten again. Cover with plastic bag or plastic of some kind, poke a small hole in the top, and put out in the sun with any opportunity. Always bring them inside when there is no sun and at night times. - When seeds have sprouted, take the plastic off and keep the compost moist until the seedlings are 3 inches high. After then allow compost to just dry and then water again. Keep bringing in pots during darkness. - When the plants are 12 inches high you can harden off, gradually allowing the plants into the dark when it is frost free until they are constantly outside. This is when you can deliver and plant them in the woods or on the edge of the woods. Plant with a little chicken or natural manure at the base of the hole you plant into. With some luck your planting time could be as early as May, which is ok for a tree from a pot. Of course, a quicker way is to eat apples and poke the seeds into the grounds of woodlands, with a stick, during October and November, and hope for the best. Why not try both methods? . 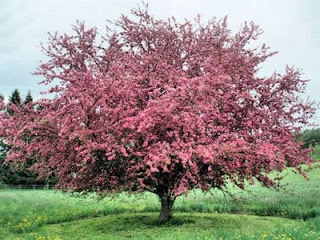 It takes about 6 years from shooting from seed for a wild apple tree to bear fruit. It seems apple trees arrived on earth just before humans, and then humans had a dependence on them thereafter. There is a lot of mythology based on the Apple being the provider of our stored dreams at night that inspire us through revelations through our day. Its is thought that fairy stories were and always always be created and be born from the imagery and nutrition of apples. Fairy stories are morphing stories that can either reveal the dark side of our dreams, if we try to avoid them, or the light side of dreams if we choose to let them guide us. Apples have always been the inspiration of Bards, both the cause of inspiration and told of in words and tales from inspiration. Many stories of the dawn of man and the fall of man include an apple or more. The Adam and Eve story is a popular one with many of us. Celebrations of apples through September, October and November in the the Northern Hemisphere enter us into the mythology of the fae, sidhe and goddesses, such as through wassailing and making of toffee apples. The making of mead and cider are quite ritualistic. Wild apples are too bitter for most of us to eat so cider and adding honey to make mead put them to use and and effects amplify our visions and passions. Ireland is linked with potatoes as is staple winter food, but that has only been so for a few hundred years under the command of the English. Before then the winter staple, right back to ancients, was apples of some form. Hunter gatherers, the humans here before the farming humans arrived, depended on wild apples for their diet, health and medicine. 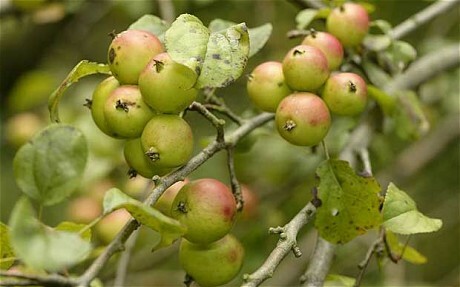 Meanwhile, lets get those apple plants started, eat more apples and poke their seeds into the edges of woods. Lets get the population of wild apples soaring everywhere - especially in Ireland.